This week my husband Mark took some much needed vacation time. Yesterday we decided to drive up to Ventura for lunch, and to shop in some of our favorite antique and JUNQUE shops. After lunch we walked around Main St. to shop. We stopped into what I like to call a junktique shop. That's when I spotted the STAR Tiara!! We had a great afternoon of walking, talking and shopping. When we got home, there was a little package waiting for me in the mailbox. It was my very cute and glittery bluebird tags, that I ordered from Becca of Bluebird and Roses. I was very excited to see them in person. They are really sweet. They have the most dainty pale blue ribbons. Husband, lunch, tiara, tags, YAY!!! Maybe tomorrow I should clean house wearing my tiara. I guess now that I have 3 tiaras, I officially have a collection. I thought you might like an update on Isabella Crane (dress form extraordinaire). She is standing in my office and in my opinion, kind of naked. So I thought I would dress her up a bit. I got out the trusty papers, scissors, glue and of course glitter, and made her a beautiful crown and sash. She looks so much better and less naked. Although I think she needs some kind of pretty skirt. (Something to look for at the next flea market). I also thought you might like to see what I did with the cute chair I bought on Saturday at the Paris Flea Market. I incorporated it into a little garden vignette. I would like to take this opportunity to tell all of you how much I appreciate, all of your wonderful comments. I look forward to reading and seeing your blogs each day as well. I am amazed at how many nice, friendly special women there are, with the same interests as I have. I didn't realize how much fun I would have, sharing with all of you. I haven't been doing this too long, but I am having a wonderful time. Saturday part 2 Ducks and a package from Sadie Olive! Look what happened after my Paris Flea Market post. A mommy duck and her babies were walking down my street. My husband was calling for me to hurry outside, and he ran in and got the camera. They were going by so fast that I had to follow them to some neighbors houses. I think I counted 8 babies, but when they are grouped together like that they are hard to count. Wow dolphin and ducks all in the same day!! Then while I was outside, I got a package delivered from Sadie Olive. I ordered these metal containers, I think on Thursday. Sara sent them lightening fast!! They are really cute. I am going to use them to keep my lotions etc. in my bathroom. She sent me a lovely note with some extra little goodies inside. She is so sweet, and her online shop has some really beautiful items. So it was a very fun, and exciting day. I hope good things are happening to all of you out in blogland!!! Today Mark and I got up early to go to Paris. Not really, just the Paris Flea Market in Carpinteria. It was a gray, cold and foggy morning. Carpinteria is probably 10-15 minutes south of Santa Barbara. This flea market is fairly small, but really shabby and French, and girly too! My husband patiently waited while I browsed, and shopped. I bought that cute little chippy green chair. (It's child size) I think I will use it for a plant stand this summer. Then maybe in the fall, I will set a pumpkin on it. I got a cute book about birds from 1942. The illustrations are fabulous, and it was only $4.00. I also bought a beautiful red and yellow toile table cloth. I got to visit with Jennifer Grey. You might know her from the old painted cottage. On the way back down the coast, we saw some dolphin frolicking in the waves. This was a good start to the long weekend. Next Sunday it is off to Ventura for another flea market, YAY!!! I hope you are all having a fun holiday weekend!! Back from Santa Barbara a Day Early! Hello to all of my blog friends. I am back from Santa Barbara, a day early. I sort of had fun! It was one of those weird experiences that we all have sometimes. My husband and I arrived late Tues. afternoon. We checked in at the hotel (Not my choice) Fess Parker's Double Tree. My husbands company choice. We decide to go to dinner on State St., in downtown Santa Barbara. Dinner was great, and the picture you see of the skylight, is the ceiling of the restaurant. After dinner Mark and I walked around a bit, then went back to the hotel, so I could see the finale of Dancing with the Stars!! He told me all about his frustrating, busy day. We went to sleep at about 11:30. We were awakened at 3:00am, with loudest most annoying sound. We had one of those adjoining type doors in our room. So the noise had to be coming from there, as well as obviously thin walls. This guy was snoring so loud, that I could not go back to sleep, and neither could my husband. Now mind you, my husband snores a little, but this sounded like a GIANT snoring. So Mark said to me, let me take you home. I thought, are you crazy? But that's what we did. My sweet husband drove me all of the way home (remember, we only live an hour away). This way I could be home, instead of spending most of the day and night by myself. We got home at 5:00am and Mark turned right around and went back for another long day of meetings. I on the other hand get to be at home. He will be home tomorrow afternoon. So that is my Santa Barbara story. One other note, the weather was foggy, cold and windy, so not exactly pool weather. Now I can get ready for a nice Memorial Day weekend with my family. I missed talking to all of you! Isn't this a cute store?? A picture of my sweet husband Mark. A picture of an old Santa Barbara fence. I was also tagged for the second time, by Jerusalem at My Little Life. I have to come up with 7 more strange things about me. Here goes, 1. I set the table for Thanksgiving 1-2 days ahead of time. 3. I can't go to sleep at night without turning on David Letterman. 4. I have to arrive early for everything. I hate when people are late. 5. If my husband is out of town, I have to sleep with the light on. 6. One of my favorite foods is french fries, but I haven't eaten any in 4 years. 7. I want to travel, but I am terrified of flying. Now I am suppose to tag 7 more people. This was at random, so if you have already been tagged, I apologize. Tracy at A Cottage Industry, Genevieve at Bella Enchanted, KLKINFLA at Jewel Box Chronicles, Mary at Oh Merci, Old Flowers For Me, Carol at Boxwood Cottage, and Meg at My Little Cottage. I hope I got that all right. I hope everyone in blogland had a wonderful weekend. I just wanted to let you all know, that I will be in Santa Barbara for a few days with my husband. It's actually business for him, and fun for me. I am planning on relaxing, reading, walking, eating, and most of all shopping. If you have never been, Santa Barbara is a beautiful place. A lovely place on the Pacific Ocean, with quaint shops and restaurants. Beautiful hotels and recreation. Our daughter Amanda actually went to college in Santa Barbara, UCSB. She met her fiance Joe there. Tomorrow is her 26th birthday. It's kind of funny that we are going to Santa Barbara, considering it is only about an hour from home. It is like another world though, very laid back and casual, yet elegant all at the same time. I will take a lot of pictures, so I can show you when I get back on Friday. I will catch up with you all then. I want you to meet Isabella Crane, my new dress form. I have been looking for one, for awhile now. Last Sunday at the Rose Bowl Flea Market, for instance, I missed one" by that much"! I found one at the local thriftshop, but the ladies there wouldn't sell it to me. They said that they would be using it, to display dresses. And they would, never ever sell it. Two of my favorite shops, in Ventura had them too, but not for sale. So Monday afternoon, I decided to go about 20 minutes away, to this really great Antique Mall, in Agoura Hills. The first shop that I checked had several old dress forms, at really HIGH prices!! Then I found Isabella!! YAY!! She was exactly the one, that I had been looking for. She was also 20% off. YAY again!! So the rest is history. I believe that I was meant to have her. She is my Mother's Day present, from my husband Mark. Now for the name. I told my daughter Amanda, that I wanted to, name my dress form. Well, the first thing she said was, that I need a pet! Then she came up with, Isabella Crane. (sounds like a Soap Opera name). It is a reference, to Ichabod Crane and the Headless Horseman, of Sleepy Hollow. Hence, the no head. Amanda, always comes up with, good ideas like that. Even though Ichabod, was not the headless guy. If you can see the necklace she is wearing, I've had it since I was little. It is an antique, that an Aunt had given to me, with a picture of my grandparents inside. I hope all of you, have a wonderful weekend. Look how cute is this?? 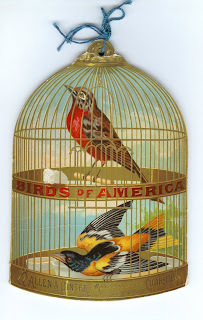 It is a book, in the shape of a birdcage, all about Birds of America. My friend Joan has tons, (I mean tons) of collectibles, like this. One day, she brought some things, over for me to look at. I admired this birdcage book. She emailed a picture of it to me, so I could have it. It came out so clear, that I wanted to share it with you. Joan tells me, this was a giveaway, (Can you believe with cigarettes), back in the 1920's or so. I just thought it was so pretty! I may have to use it, in a future card or collage, sans the word cigarettes, at the bottom. I'm glad Joan brought this out of the attic for me to see. Apparently she has been holding out on me. I had no idea she had this stuff. By the way, Joan is my good friend, and walking buddy. As far as we can remember, we have been walking together for about 13 years. Our kids have known each other, since kindergarten. You never know, what your friends might be storing in the attic. I hope you enjoy the picture, as much as I do. So here is the second set of pictures. I got that really great mirror, for $20.00, and the angel and trellis for $60.00. Thought you might like knowing the prices at the Rose Bowl. Some items are priced really high, and some are pretty reasonable. I think some are so high, because if they don't sell an item, they can always try next month. The Rose Bowl is every second Sunday, of the month. So far I haven't decided where I will put these new treasures, but I really love them. I thought that you might like to see the roses, and card that my husband gave me for Mother's Day. My day ended by, having a nice dinner, with my daughter, her fiance and my mom, and my husband, of course. Check the post below this one, to see the Rose Bowl. Here is the Rose Bowl Flea Market, yesterday. It was a great day in Pasadena. The weather was not too hot, or too cool. It was the perfect California day. I will do a second post to show you, what treasures I found. I haven't quite, figured out how to post more pictures at a time. I hope you all had a lovely Mother's Day, I did. By the way, that is me in 2 of the pictures. Hope you are all having a great Friday, which goes into a great weekend, and a wonderful Mother's Day, for you you moms out there. My husband and I, are going to the Rose Bowl Flea Market on Sunday. I will let you know what I find, next week. We will have dinner with, my daughter, her fiance and my mom. Sounds like a fun Mother's Day to me. Have a great weekend, and Mother's Day!!! Here is the pink terrarium, not pink anymore. Not sure yet where I am going to keep it. I usually move things around all day, until I find it's permanent home. I really like the red. It was a little bit tricky getting the glass back in. I think it was worth the effort. I can't wait to see what I will find this weekend. I have asked my husband to take me to the Rose Bowl Flea Market, for Mother's Day. Just a little update from yesterday. The .50cent pink tray, is now a new tray to hold my fun card making supplies. I think it came out really cute! I am still working on the terrarium. It is slow going with the red paint. I will post it when I get done. I am trying to work on it, while doing 10 other things. You know how that is. Now fast forward to Sunday morning. My husband and I arrive at the Ventura Flea Market at around 7:15 am. It is a beautiful day next to the Pacific Ocean. The Ventura Flea Market is located at the Ventura County Fair Grounds, which is right next to the ocean. Pretty nice! I also picked up some really nice ephemera, at various booths. I didn't spend more than $6.00 on all of it. So, needless to say it was a fun weekend of treasure hunting. My favorite kind of weekend! Now, I am going to go do some serious painting. So, I have been tagged for the first time by the, Purple Flower Fairy. I guess I have to list 7 weird things about myself. 1. I have watched the movie, You've Got Mail about 80 times, and I never get tired of it. 2. I drink Arnold Palmers (1/2 Iced tea & 1/2 Lemonade) constantly. 3. I love scary movies. 5. I don't like chocolate chip cookies. back to it's original spot. 7. I can't go to bed, if there are dishes in the sink. I hope that you don't think that I am too weird. Now I guess I have to tag 7 more people. So sorry in advance, I just chose at random. Yesterday morning on my way home from the grocery store, I had an impulse to stop at the local thrift store. I figured I could only stay for a few minutes, considering I had groceries in the car. Anyway, I did, and this is what I found. Well it didn't exactly look like this when I found it. (I should have taken before pictures, but I always forget to do that, when I am excited about starting a project). It started out really ugly, take my word for it. It was a dark greenish color, with sort of painted books on the front of it. I think they were going for that fake library book look. So I put some primer on, painted it with a cream color, then shabbied it up a bit. The weird thing is that I have been looking for one of these mini armoires. I looked on ebay, and at some flea markets. 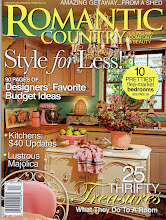 The prices ranged from about $20.00 to $35.00 plus shipping etc. Well, this one was only $7.00. So when you have that sudden impulse to pull over to that thrift store, garage/yard sale or side of the road, DO IT!!! After my walk this morning, I went to the nursery and bought more flowers to plant. I should really be cleaning the house, but I would rather be outside planting flowers. It is such a nice day! I also started a little project yesterday, which I will show you when it is finished. So I guess I will get off of the computer and go and plant these flowers. I hope you are having a lovely May Day!! The sun is finally out here, after a very foggy morning. In Southern California, it is known as May/June gloom. I thought you would like to see my first little project, using some of the items I purchased over the weekend. My daughter's 26th birthday is coming up, so I thought she might like a handmade card from mom. I guess she can't look at my blog now, until her birthday. Well, I am going to get outside now, and take advantage of the nice day. I need to do some trimming in the garden.